A Private Equity Offering or Private Placement of Securities is the process of offering and selling securities to prospective investors without first registering the securities with the Securities and Exchange Commission (“SEC”) or, for securities sold only in Illinois, with the Illinois Securities Department – which is responsible for the regulation of the securities industry in Illinois. In other words, the entrepreneurs, business owners conducting the private equity offering in a raising capital event must apply for and operate under state law and federal securities exemptions. In a private placement, a business or entrepreneur raises capital by selling equity to select investors (family, friends, key employees, angels, institutional investors, venture capital companies, etc.) meeting certain qualifications. Business owners and entrepreneurs seeking to raise capital by means of a private placement usually do so because of the lesser time and cost associated with the private offering’s preparation and execution. 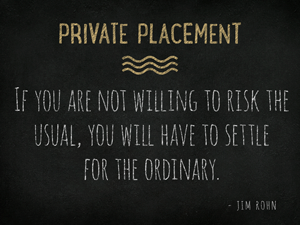 In addition, private placements offer companies the ability to customize the private offering for select, targeted investors, set the terms and conditions of the private offering, and keep the information regarding the company private. Generally, founders and officers of the new business or start-up company prepare and coordinate the private placement process and provide the necessary research and information to ensure the offering is structured in the manner that best suits the company’s goals (and those of the select, targeted investors). At a minimum, the business and its founders should engage a Chicago corporate attorney with experience in securities laws matters to guide the business owners through the complexities of preparing the private placement memorandum, securities law, securities law exemptions, and blue sky laws. Business accountants are also necessary to provide financial reports and projections. Finally, the business and its founders should work hard to focus on the number and type of potential investor it’s seeking to attract and the features of the offering should be tailored with that type of investor in mind. In the end, if there is a successful private offering, the investors will be married to the founders and the company for a lengthy period of time. At a minimum, the business and its founders should engage a Chicago corporate attorney with experience in securities laws matters to guide the business owners through the complexities of preparing the private placement memorandum, securities law, securities law exemptions, and blue sky laws. Business accountants are also necessary to provide financial reports and projections.